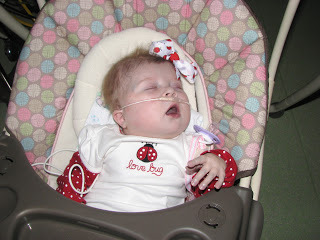 Annabelle’s 1st Valentines Day, February 2011. Yup, we’d taken her swing to the hospital. She LOVED it… although all her cords were so heavy that usually it barely was able to swing since the cords tugged on it. Goodness.. she was my sweet blue baby! LOVE HER! Woke up to flowers and yummy chocolates from my hubby. Got heart-shaped donuts for kiddos to start their day off with a ton of sugar… which I’m sure teachers appreciated since I know they got plenty more during the day. Had lunch with my hubby and brother-in-law. Splurged and took a nap while Annabelle napped. I NEVER do that. But.. I was pretty much wiped out. I’ll be honest. IT WAS NICE! At the heart of everything… And really, that’s what the past week has been about. The heart. The anatomical heart and all its defects and issues. Because as we well know, issues with the heart affect the whole body. The heart supplies blood and LIFE the every limb, and without life-giving blood, life can’t happen. So, back to my point.. at the heart of everything…God is our life giving blood. He is love. He is what runs through the veins of our soul and gives life. Because of that, I just couldn’t end talking about hearts without talking about Jesus. I feel like this blog post is a bit random and disorganized, which is so very appropriate, because my life, my heart, has felt very random and disorganized lately. But I’m so happy that as much as I want to scratch my head at times, as confused and burnt out as I can get… God knows the intricate workings of my heart and soul. He has everything under control and I don’t have to know it all or fix it all. Super SUPER thankful for that. Today, I’m just thankful for love. God’s love. My husband’s love. My daddy’s love. My children’s love. And just… for love. Happy Valentine's Day Krista! I am so glad that you had a blessed day and that you got a nap! what a great thing. thank you for sharing with us this week about heart defects and once again raising awareness.